This book feels intensely personal, each character so carefully enfleshed that I could recognize them walking down the street. The primary conflict, lived out in multiple story lines, revolves around the clean-cut, well-planned suburban lifestyle versus the creative and/or unconventional lifestyle. How many of us wonder about life might have been like on the road less traveled? Also, what does/should family look like, and more particularly, what does it mean to be a mother? I wanted to like this book. The author is just a few years younger than me, and I wanted to learn first-hand what it was like to grow up in a missionary family serving in Haiti. I wanted to hear about whatever intentional or accidental impact they had, and that the Haitians had on them. I wanted to know how the experience affected their family and their faith. Irving’s writing is passable, occasionally better than, but also humid-heat-dreamlike to such an extent that, more than once, I had trouble following her. I kept thinking that yes, she did have a story to tell, but that she needed a far better editor. The library wanted their book back, and I couldn’t imagine picking back up where I’d left off. So I won’t. At only seven chapters and 218 pages, this short novel packs an epic wallop! I picked it up after learning that the movie (which I haven’t yet seen) was based on a book, written by the incredible Meg Wolitzer. I would love to hear her speak about what this writing process was like, a woman writing about a woman hiding her fierce talent behind a man’s ego. You sound bitter, Bone would say. Everyone needs a wife; even wives need wives. Wives tend, they hover. Their ears are twin sensitive instruments, satellites picking up the slightest scrape of dissatisfaction. Wives bring broth, we bring paper clips, we bring ourselves and our pliant warm bodies. We know just what to say to the men who for some reason have a great deal of trouble taking consistent care of themselves or anyone else. A friend bought me the Gregor series when she discovered I liked The Hunger Games but hadn’t read Collins’s earlier books. These are fun, imaginative books. Engaging enough to keep my interest and great for a quick, entertaining read. I am not a horror fan. In fact, I stay well clear of that genre altogether, in books and movies. But having seen and appreciated the movie versions of King’s books Stand By Me, The Shawshank Redemption, and The Green Mile, I thought I’d give this one a chance. I’m glad I did. The book invites readers to consider: What would change in your life if you actively anticipated the day of your death and, instead of feeling sick, you felt better than ever? How would you prepare for the end, and how could you help make the world a slightly better place before you depart? I read a lot of these books and my house is still way too cluttered. But this one had new light to shed on the piles. Containers – not as in “I need more” but “the containers you already have limit what you keep.” As in, my house should have space to contain my life, not just my stuff. And my closet should contain my clothes; if it doesn’t, I have too many wearable items. Or (ouch), my bookshelf should contain my books (and a few knickknacks, like framed photos, etc); if my books don’t fit my shelving, I don’t need more shelving but fewer books. What you reach for first is your fav. Before you put away the clean dishes or laundry, get rid of something still in the cupboard or drawer, since clearly the thing you used and cleaned is the thing you prefer. I’ve been following Jamie’s Facebook page, and occasionally her blog, for years. She had left Costa Rica before I discovered her, and I was about to leave with my family for a three-month sabbatical. We both have a thing for Jesus, so we also share that in common. I knew what I might expect in this book, but I didn’t know I’d crack the cover in the morning and finish reading the book before dinner. This is a good memoir, but it’s not a book I’d recommend to everyone. People inclined to dislike Jesus-followers, the Christian church, and missionaries probably shouldn’t bother. People inclined to defend the Church and the way missions have been done over centuries without question also shouldn’t bother. But those who want a fresh take on all of the above–and who have an open mind (and aren’t overly bothered by sarcasm and swearing)–might truly appreciate this book. In fact, I am hoping others I know will read it so we can have a conversation about it. 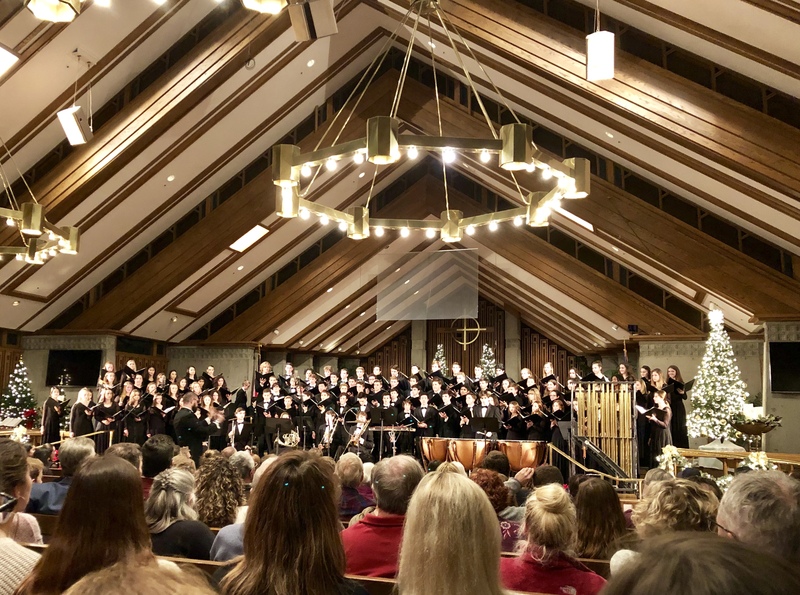 Last night, for the first time, we attended our high school’s holiday concert called The Wassail. When I asked Q14 if he’d like to attend, he asked about the unfamiliar word. I sang the first line or two of the carol, enough to jog his memory, and explained that wassail is also a drink similar to mulled wine. So wassailing is caroling and drinking and celebrating the season. In our town, Wassail is a tremendous holiday concert. Now that we’ve experienced it firsthand, I anticipate we’ll make attending it an annual tradition. Up to 120 high school singers, plus instrumentalists for a few numbers, made unbelievable music like I’ve never heard. During one piece, as vocalists encircled the audience and literally surrounded us with song, I closed my eyes and nearly wept for sheer beauty. And Christmas arrived. Not the actual day, that’s still next week, but the spirit of Christmas. I always pay attention for that moment when I feel Christmas. Some years it never comes, or comes after Christmas has ended. These talented young people ushered the Christmas spirit into my heart. When I looked up wassailing, I read that the tradition has pagan roots, that men would put cider-soaked cakes under apple trees while banging pots and pans and singing in order to ward off bad spirits and exhort the trees to healthy production in the next year. With all the Christmas and end-of-year activities, I’ve been feeling tired. I see it on others’ faces, too: the joy and the weariness. I am still tired today, but last night’s Wassail sure chased away some Grinchy bad spirits. Hearing those young people sing so beautifully, having invested so much of their time and heart into rehearsal, it reminded me that there is hope. We have hope. This morning I met a friend for coffee. As we waited for our drinks, a man sporting one of those obnoxiously funny Christmas suits held open the front door as 20+ preschool children filed in. They lined up near the counter and started singing Jingle Bells. People got up from their seats to better see and hear them as they continued to sing three songs in all. One couldn’t help but silly-smile at so much cuteness. Buddy the Elf was right: The best way to spread Christmas cheer is to sing loud for all to hear. The year C20 had his first birthday, Guy and I both turned 30 a few weeks before and after. Our birthdays span November to January so Thanksgiving, Christmas and New Year’s got wrapped up in the fun. 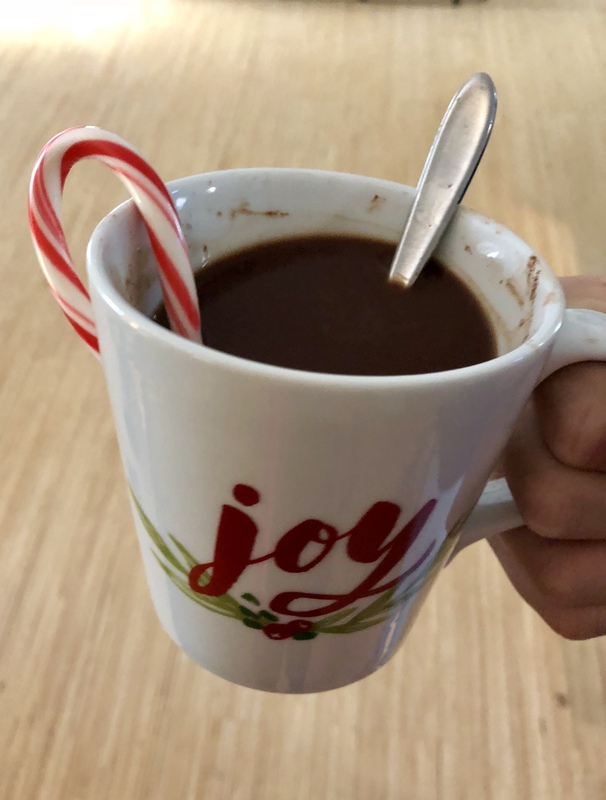 We created a list of small celebrations we could enjoy each day during those eight weeks, simple activities like sweetening a mug of hot chocolate with a candy cane, going for a walk together, or watching an animated Christmas movie. We celebrated our lives and the holidays with flair. 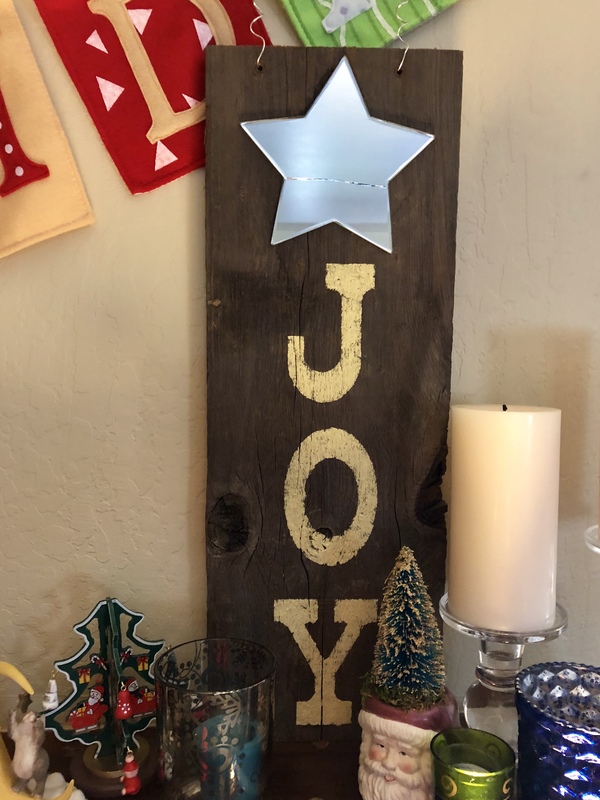 As I spent this last week reflecting on joy, I realized that I might be doing Advent wrong. Or, at least, wrong for me at this time. Other than chomping the daily chocolates in our Advent calendar, I didn’t grow up with an Advent tradition. The time between Thanksgiving and Christmas was simply Christmastime, when we listened to Christmas music and shopped and wrapped and enjoyed the season. I appreciate Advent for its thematic focus, its intentionality, its lens on waiting for Jesus. But over the years, our church has adopted a fuller Advent tradition, limiting Christmas music to Christmas Eve and the following Sunday (and the annual Christmas concert, the one exception to the rule) in favor of Advent hymns. And since there are only two popular Advent hymns—Come, Thou Long Expected Jesus and O Come, O Come, Emmanuel–the music sounds like the rest of the year. So even though I used to start listening to Christmas music in October while I planned the church Christmas materials, I have mostly stopped listening to Christmas music before Christmas. And I’m missing it. I’m missing the joy. I’ve employed the discipline without reaping the benefit, and I’m sorrier for it. I feel dry and dour. Perhaps traditional Advent observance might also necessitate the observance of the Twelve Days of Christmas–Christmas celebrations commencing on Christmas and lasting until King’s Day on January 6. But I’m not there; when Christmas is over, it’s over. And since so much of life necessarily involves waiting for Jesus, I want to enjoy Him now. I want to celebrate Him today. I don’t want to wait any longer. Besides, there is way too much good Christmas music to limit it to a day. Those of us who follow Jesus live in tension between the already and not yet. Jesus has come, and He will come again. We have the joy of salvation now, but we won’t experience the fullness of life in His Kingdom until the second coming. So we wait. But why in the world am I intentionally limiting the joy of celebrating His birth? Sure, His birthday is next week, but He’s already here. This year the discipline feels a little absurd, like not talking to my son for the month before his birthday just because his birthday hadn’t yet happened… What sense would that make? This week’s focus is faith, that God will direct our paths even (especially) when the way seems foggy. I’m staring intently down some foggy paths of my own, and I do believe that Jesus will show up, that He will hold my hand and walk gently with me. And I’m going to celebrate that reality today, with some Christmas music, even as I wait for His eventual arrival. Light three candles (two purple, one pink): We light these candles to celebrate Jesus, the Light of the world, who comes into the darkness to bring hope, joy and faith. Read: A good man, Joseph found himself in what looked like a bad situation. While he quietly planned a way out, an angel assured him that he had no reason for fear: what seemed like bad news would be good news for everyone. Mary’s baby wasn’t just any baby—this would be God’s baby, Immanuel, God with us! When we accept God’s plan, God turns our fear to faith and our faith to joy. Pray: Holy Spirit, where we feel fear, plant your seed of faith. Grow our faith into joy in your presence. In the name of Jesus, we wait and pray. Amen. Monday Deuteronomy 7:8-9 How does God’s faithfulness inspire your faithfulness to Him? Tuesday Psalm 93:1 How do you hang on in faith that God is in control? Wednesday Isaiah 26:3-4, 12 What worries do you need to put in God’s hands? Thursday John 14:27 Let go of your troubles and receive Jesus’ peace. Friday Colossians 1:3-4 Who can you thank God for as an example of faith in Christ? Saturday Hebrews 11:1 How do you define faith? Make a list of things in which you put your faith, for example, that your alarm will go off in the morning or that the lights will come on when you flick the switch. Try to count as least ten. Then ask: Is it (or, why is it) sometimes easier to trust in these mundane things than to trust in the God who sent His Son Jesus to be our Savior? Incorporate silence into your daily routine and use it as a chance to talk with God. Drive with the radio off. Go for a quiet hike. Sit in silence with your morning cup of coffee. Read your Bible, and let God share with you His perspective on what you’re facing each day. When have you seen God show up in your unexpected or unwanted circumstances? Where do you need to experience His presence currently? Lately I have been impressed with stories of joy: people enduring difficult circumstances with genuine smiles lighting their faces and claims of, “Laugh or cry, I choose to laugh,” or “I was born a happy child,” or “I choose to do something I enjoy every day.” People who, in witness to others’ difficult circumstances, decide to get their hands dirty and serve, to make life that much easier or better for someone else, and discover joy in the shared experience. Unlike happiness, tied to experiences that easily elicit smiles and laughter, joy is a choice. A decision to rejoice even when the circumstances don’t seem to warrant it. A connection to God who is the source of all true joy. Happy comes easy. Joy requires intention, effort. I wore an audaciously bright pink scarf to church today (atop a gray/black pant/sweater set) and mentioned to someone that the scarf was in honor of Mary’s joy. Eyes wide, she chuckled, incredulous that I would match my outfit to Advent. Well, I suppose that’s an insight to the odd workings of my mind! And, yes. We can find hot pink joy against a dark background. We can find joy in a cute Christmas mug filled with messy clumps of hot chocolate. We can find joy in the homemade and gifted decoration even though the mirror has cracked. We can seek–and discover–joy in the clumpy, broken, messy, difficult parts of life… That’s kind of the whole point: we rejoice in God with us, because God walks with us through life. Light two candles (purple): We light these candles to celebrate Jesus, the Light of the world, who comes into the darkness to bring hope and joy. Read: The angel announced, “Mary, highly favored one, the Lord is with you,” and Mary rejoiced at the role she would play in the coming of the Son of the Most High. God’s Spirit whispers to each one of us, “You, too, are God’s servant, with a special role to play in God’s story.” The story may turn and twist in ways we can’t anticipate but let us say “Yes!” to God’s calling and rejoice in His presence. Pray: We rejoice in God our Savior who has been mindful of His humble servants. In the name of Jesus we wait and pray, Amen. Monday 1 Samuel 8:6-7 How can you rejoice in Jesus your King today? Tuesday Psalm 5:11 How does God’s protection increase your joy? Wednesday Habakkuk 3:17-19 How can God increase your joy even when times are difficult? Thursday Acts 16:33-34 How does believing in God give you joy? Friday Galatians 5:22-23 Ask the Spirit to increase your joy. Saturday Jude 24-25 Read these verses aloud as joy-filled praise to our good God! Take a Christmas treat or poinsettia to someone who lives alone. Find a way to serve someone, for instance, clean an older neighbor’s gutters. Invite friends to join you for a cookie decorating party and/or viewing of a favorite Christmas movie. Create handmade thank you cards and attach candy canes for your teachers or church leaders. Gather a group and go caroling. Pray over each Christmas card you receive, inviting God to rain joy over each household.